At times you may want potential attendees to agree to a certain policy, certain terms and conditions, or even a refund policy, before allowing them to register for an event. 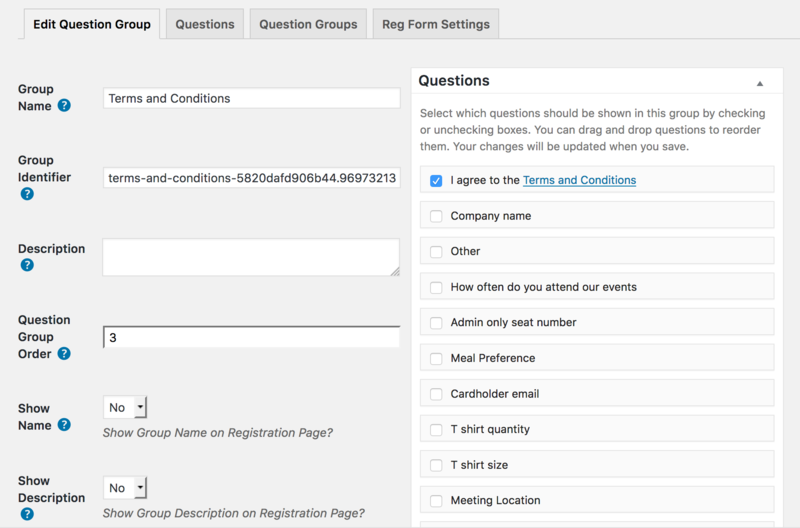 This tutorial will show you how to use the custom registration form questions to create a checkbox for attendees/registrants to select before they can register. The video is best viewed in high-resolution. 1) Create a WordPress page and add your policy to it. You don’t want to add all the policy text to the registration page (although you could if you added it to a Group Description). Instead we’re just going to link to that page from the question on the registration page. That way you can maintain your policy without worrying about the effect on the registration process. Add a hyperlink from the question to the policy page by adding a HTML hyperlink. See first example below. Type: Select the type of question you want to display. We recommend a Checkbox so that it requires the attendee to activate and agree to the question. Values: You want the value/answer displayed to the user to be something similar to “Yes” or “Yes, I agree to the Policy” so they know they are specifically agreeing to the question. (Optional) You can let someone answer “no” if you’d prefer. Required: You can decide to force attendees to answer this question before they are allowed to finish the registration form. 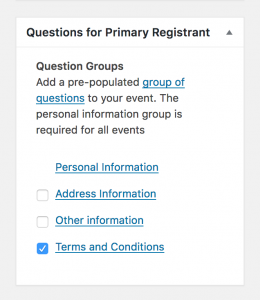 In order for a question to be added to an event, it must be included in a question group. 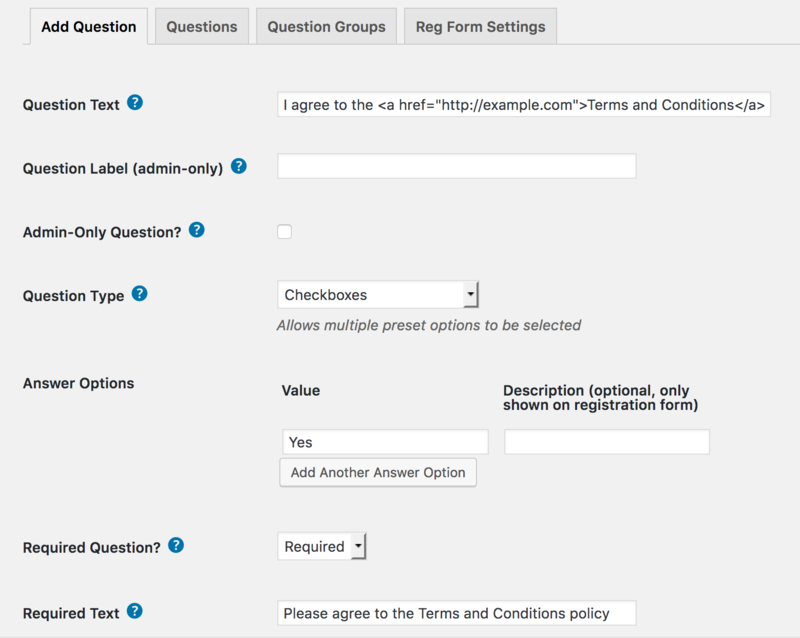 The question can be added to an existing question group or you can create a new question group. 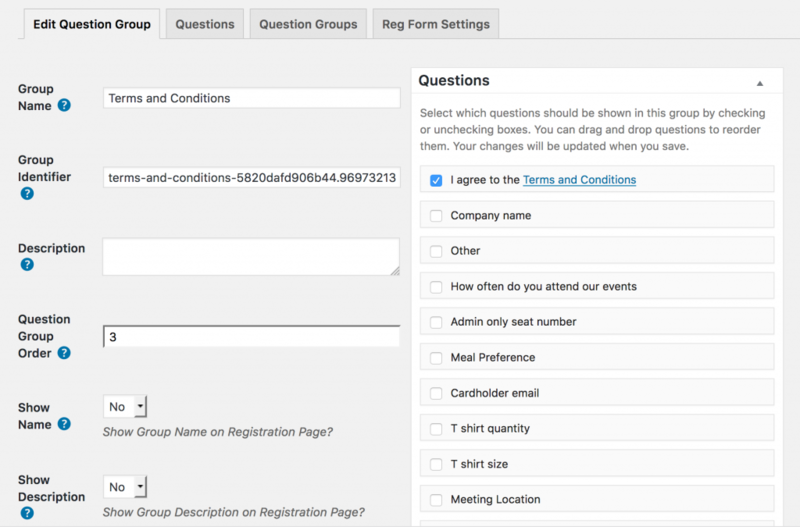 Once you’ve added the question to a question group, you’ll need to activate that question group for an event. Update the event to apply the question group. 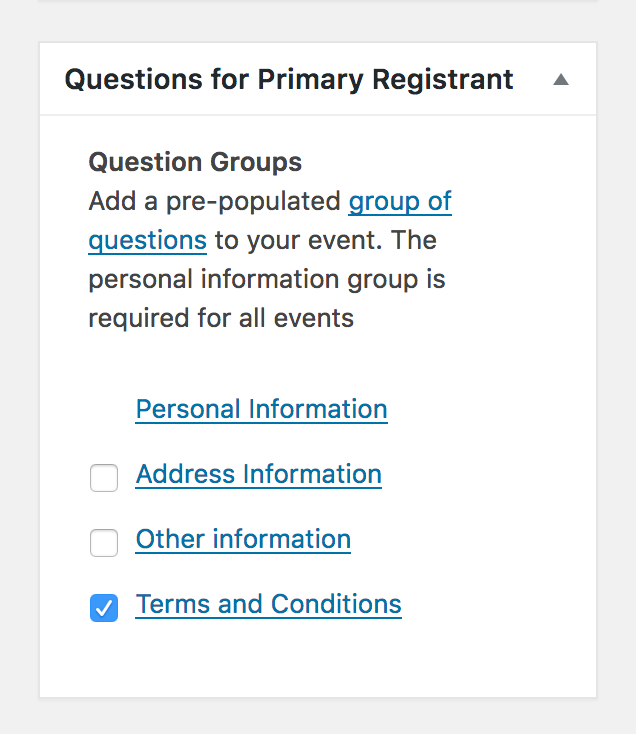 After updating your event you’ll then see that the question group is now added to the registration page and the text of the Terms and Conditions Policy is now a hyperlink to the policy page.